The beautiful camillia flower blossoms on a broadleaved evergreen shrub that originated in the highlands of China and Japan. If I have been remiss in not painting these more often, it's simply because they don't grow here in New England. They need zone 7-9 and we are zone 5 and lower here. Too bad! 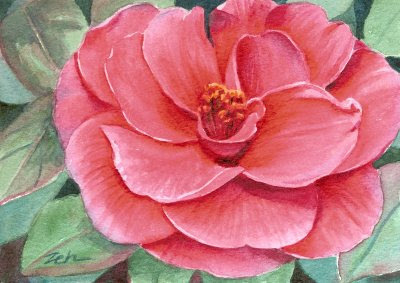 The camillia grows abundantly in warmer climes brightening gardens and hillsides with gorgeous springtime color and fragrance.